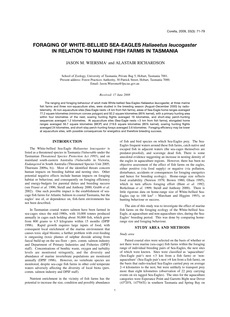 The ranging and foraging behaviour of adult male White-bellied Sea-Eagles Haliaeetus leucogaster, at three marine fish farms and three non-aquaculture sites, were studied in the breeding season (August朌ecember 2000) by radio- telemetry. At non-aquaculture sites (Sea-Eagle nests >8km from fish farms), areas of Sea-Eagle home ranges averaged 77.2 square kilometres (minimum convex polygon) and 92.2 square kilometres (95% kernel), with a primary hunting area within four kilometres of the nest; soaring hunting flights averaged 16 kilometres, and short-stay perch-hunting sequences averaged 1.2 kilometres. At aquaculture sites (Sea-Eagle nests <3km from fish farms), elongated home ranges averaged 56.7 square kilometres (MCP) and 219.6 square kilometres (95% kernel); soaring hunting flights averaged 24 kilometres, and short-stay perch-hunting forays averaged 3.6 kilometres. Foraging efficiency may be lower at aquaculture sites, with possible consequences for energetics and therefore breeding success.